Eight people have been killed and a number of others injured after a shooting at The Tree of Life Synagogue in Pittsburgh, US on Saturday. 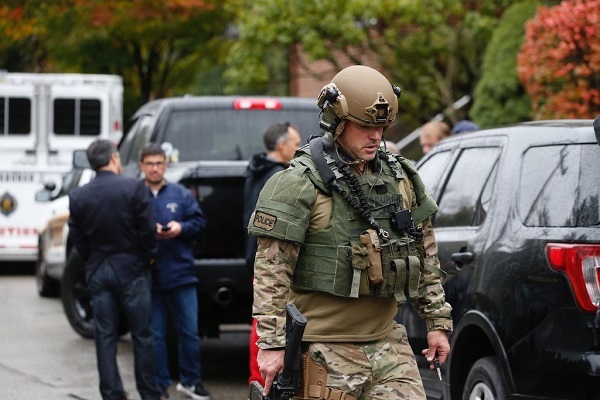 Pittsburgh Police spokesman Chris Togneri confirmed that the suspect was now in custody and three police officers had been shot. He also confirmed multiple causalities, but did not divulge exactly how many. The suspect has been identified as Robert Bowers, 46, reported CNN, citing law enforcement officials. The gunman made anti-Semitic statements during the shooting, said a law enforcement official earlier. "It's a very horrific crime scene, said Pittsburgh Public Safety Director Wendell D. Hissrich at a brief press conference. "It's one of the worst I've seen, and I've (worked) on some plane crashes. It's very bad," he added. The New York Police Department said it had deployed officers to synagogues throughout the city as a precaution, reported BBC. US President Donald Trump described the shooting was a "terrible, terrible thing". "To see this happen again and again, for so many years, it's just a shame," he told reporters on Saturday. He described the gunman as a "maniac" and suggested the US should "stiffen up our laws of the death penalty". "These people should pay the ultimate price. This has to stop," he added. When officers arrived, the gunman reportedly shot at them, forcing officers to use their vehicles as a shield. A suspect, a heavy-set white male with a beard, has surrendered. The SWAT team had been talking with the suspect, and he was crawling and injured. It is unclear the extent of his injuries, reported CBS Pittsburg. Police are also investigating if he announced his intentions on Twitter this morning. That account has since been taken down.